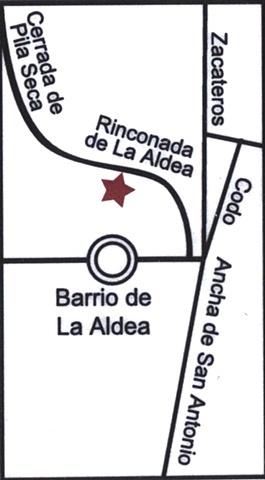 Enter Barrio de La Aldea which is the big white arch where Zacateros and Codo meet to form Ancha San Antonio. Take an immediate right down the steps onto the walkway which is a covered arroyo. Follow it around the curve and to the door of the Arroyo Gallery.